I have brought a new horse into our herd. Martini is a 7 year old quarter horse mare. She is so friendly and sweet. At first I thought she was an Earth horse temperament type until I watched her eat. Our Tai Yin(Earth/Metal) horse, Tanq, resembles a vacuum cleaner when he eats. My Fire mare, Cerise, believes in chewing every bite of food at least 40 times. Martini takes eating slowly to a whole new art form. She takes each pellet of food and chews it at least 40 times. I don’t know any Earth horse that would approach food this way. I think Martini is a Shao Yin(Fire/Water) temperament type. She is so sensitive. When I introduced her to Cerise and Tanq she never put her ears back or threatened in any way. She is yielding to both Tanq and Cerise but does not show any fear of them. When I was getting everyone sorted out at feeding time I got aggravated at Cerise for not going into her regular stall to eat. Martini calmly walked to the far end on the pasture until I got everything sorted out. She certainly does not want to be involved in any trouble. Martini is a bay and very pretty. She has delicate features and moves very well. I have never had a Shao Yin so I am very much looking forward to learning more about her. Luckily, Martini has had a wonderful start in life and she is very trusting of people. When bringing her from Texas to Colorado we stopped overnight in Clovis, NM just as a cold front was blowing in. She left TX at 80 degrees and unloaded at 35 degrees with a 50 mile an hour wind. Martini stood perfectly while I put a light blanket on her and when we put her in her run she walked right to the water and took a drink. Then she said hello to a horse across the fence and went to eating her hay. I am in love! I don’t have any agenda for what Martini and I will do together. Cerise has been retired for about a year so I am looking forward to having a riding horse. With Cerise being retired from riding I have come to enjoy just hanging out with the horses. Cerise loves to have her belly scratched and I want to get to know Martini’s favorite scratching spots before I rush into riding her. I will also do some ground work and liberty work to build our relationship. I want to make sure Martini trusts me as much as her previous human partners. Once we get to know each other then we will find out what we both like to do. Maybe I will get to barrel race again as Martini has some barrel horse training. Should be fun to find out. If you haven’t discovered temperament typing and discovering your horse’s 5 element type, there’s no time like the present. You can dive into the subject a little or a lot. Here are some of the resources to help you. Unless otherwise attributed, all material is written and edited by Madalyn Ward, DVM. Copyright (c) 2018 HolisticHorsekeeping.com and Madalyn Ward, DVM. All rights reserved. If you like the material in this newsletter please let your friends know about it. You may reprint material in other electronic or print publications provided the above copyright notice and a link to http://www.holistichorsekeeping.com is included in the credits. You can get off this list by sending an email to info@holistichorsekeeping.com. When you forward this material, please send the entire newsletter. Thanks! 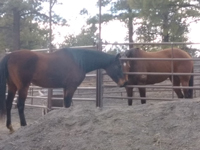 This entry was posted in Five Element Personality Typing, Newsletters and tagged horse temperament, horse temperament types, Horse Training on April 15, 2018 by Madalyn Ward, DVM.